Ending the blog on Manchester Piccadilly wasn't planned. I mean, it was sort of planned - I don't just chuck these things out you know - but it mainly came about because I realised I'd forgotten about it. I collected Oxford Road back when this blog was Round The Merseyrail We Go and the name "Merseytart" actually made sense. I visited Victoria then too, although as I didn't actually take a sign pic, it took a few years for me to collect it properly; pleasingly, I collected it with Ian and Robert, two friends I actually made because of this blog. And I collected Deansgate on a very special day trip to Coronation Street - the old, Quay Street set that's now been knocked down. I saw Audrey Roberts and everything. Manchester's other three stations covered different aspects of the blog, over the years, so it seemed appropriate to finish up at Piccadilly. It helps that Piccadilly is a fine station. A fantastic Victorian trainshed over busy platforms, always moving, always thronged. It could be argued that Piccadilly is the centre of the North's rail network, perhaps only rivaled by Leeds. Suburban and national trains pour in and out, minute after minute. Lime Street's great of course, but as a terminus, people tend to stream straight out into the city. People change trains at Piccadilly, so there's always life. The station got a hefty makeover in time for the 2002 Commonwealth Games, with a new, glistening concourse and more shops. Shops everywhere. If you need a sandwich, or a birthday card, or even a new outfit, Piccadilly's got you covered. And yet it doesn't feel cluttered. A mezzanine's been strung along the back, with a curving shopping street, but there's still plenty of space for you to mill about and watch the departure screens. They'd prefer it if you bought a crab and rocket baguette, of course, but if you just want to hang out, that's ok too. (You might not get a seat). I was feeling low, this being the last ever blog trip, so I headed out of the station for a bit of air. Curving away from the entrance is Gateway House, a great 1960s office block that sidles down from the station entrance in a lazy S-shape. For years it's been neglected, but a change of ownership has meant it's now being converted into an aparthotel. The new windows are modern but still in keeping; the architects haven't destroyed what made Gateway House special. Actually that's not entirely true. For years, the parade at the base of Gateway House played host to an Ian Allen shop. Ian Allen prints pretty much every railway book worth reading, and a lot of ones that aren't. Their shop was a lovely place to browse, with an upstairs filled with model railway supplies. I'd hoped to have a browse, maybe treat myself to a gazetteer, but it's gone. Closed forever. There's a Waitrose and a Subway, but that lovely railway bookstore has vanished. Even more dejected, I wandered round the back of the station, past the former car park which might, one day, host the HS2 platforms. That'll not be until at least 2032, when I'll be in my fifties. I wonder if I'll still care? I've realised lately how many big, elaborate projects, big national schemes, aren't going to come to fruition until I'm a pensioner. My excitement for them now is tempered by the knowledge I'll be too old to enjoy them. (Presuming President Trump hasn't annihilated us all by then). I also took the time to wave at Manchester's other station, the abandoned hulk of Mayfield across the way. Opened as a relief station for Piccadilly, it stopped taking passengers in 1960, and closed altogether in the 80s. Now it rots, looking for purpose, always on the verge of being demolished. Of course, I love it. Back round the side of Piccadilly, under the viaduct for through trains. Platforms 13 and 14 have always been hopelessly overstuffed, and they're about to get even busier once the Ordsall Chord is built and more trains can go through Piccadilly without having to reverse in the main trainshed. Network Rail has plans to build a second viaduct, with two more platforms; you would think they'd build this first, ready for all the new trains when they come, but things never work out that way. Instead, 13 and 14 will get much busier for a few years until 15 and 16 arrive. I ducked into the Metrolink platforms, for a look. I still adore the trams, and putting them in Piccadilly's undercroft makes them even better. I just like the word "undercroft". There's too much space for them, if anything, with a big empty concourse that never fills, but it's clean and modern and charming. They're another part of Manchester's glistening network that's about to get bigger, with works approved for an extension to the Trafford Centre (about 20 years after it should have been built, but anyway). And that was it. I'd pretty much "done" Manchester Piccadilly, which is good in a way, because I can never remember how to spell it (two c's? two d's?). I wandered round to the front and took the final sign selfie. End of the line. In the run up to this day, I'd always fancied getting a meal in one of Piccadilly's restaurants to celebrate. A kind of final hurrah. However, even though it's overloaded with catering outfits, none of them took my fancy. Yo Sushi terrifies me, all those domed concoctions rolling by on a conveyor belt; what if you got the wrong one? What if you picked all the expensive ones and ended up with a huge bill? I've only been to a Carluccio's once, and it was rubbish. And eating in a TGI Fridays at 11:30 on a Tuesday morning, alone, would drive even the most happy and well-adjusted ray of sunshine to loop a length of cable round their throat and end it all. I ended up, appropriately enough, in The Mayfield, Piccadilly's pub, where I ordered a Newky Brown and took a seat on the mezzanine. I didn't feel like celebrating. I started this blog in June 2007, a few months after I turned 30. I didn't know it at the time, but I was in the middle of a bit of a crisis. All the things I'd thought would happen before I was 30, all my dreams, hadn't happened. I was in a job I didn't like. I was going through a very rough patch with the BF that nearly finished us for good. I didn't know who I was. Station collecting came along and helped me. They were a refuge. Crossing each one off the map became a real triumph. As it grew, as I went more and more places, it became more important in my life. I took days off to go to places at the edge of the Merseyrail map. Then my mind collapsed. Depression swamped me. I spent days in bed, not wanting to move. And yet, this blog was still there for me. It was a reason to get going. It was a reason to leave the house. As I shifted to the much larger Northern map, the pleasure of it increased. Planning, mapping, plotting. Excel spreadsheets full of train times. Ordnance Survey maps covered with routes. It became my hobby and also, in a way, my saviour. Railway stations made me smile in a way the rest of the world didn't. It brought other benefits, too. I've met some fantastic people thanks to this blog, made actual, real friends. I got invited to places, nominated for awards. I appeared in The Guardian. I actually know what Diamond Geezer looks like. I got some free flip flops off Merseyrail. It's also given me some incredible memories. I've been all over the north of England to places I never thought I'd visit - never had a reason to go to - and it's never failed to wow me. This is a wonderful, beautiful country we live in. It's filled with astonishing beauty and fascinating places and great people. Cities and towns and railway stations that we should all go to, even if it's just once, just to see. All the memories. Getting caught up in an apocalyptic rainstorm on the way to Squires Gate. Hiking over the clifftops below Chathill. Falling in a ditch somewhere around Goxhill. A night illuminated by starlight at Kirkby Stephen. Hot, sticky walks to Langley Mill and Chinley and Heysham Port. Pints of beer in Selby and Ribblehead and Snaith. Leeds and Newcastle and Bradford and Carlisle and Manchester and Liverpool and Skipton and Entwistle and Ravenglass and Mytholmroyd and Glasshoughton and Hexham and Urmston and Sandbach and Whiston and every single other spot. Every single station has a moment associated with it. The Northern Rail map isn't a map of places any more, it's a map of my brain. I don't know what I'll do now. I thought about going somewhere else. A different railway map, a different network. It just wouldn't be as much fun. I'd be doing it out of duty rather than enthusiasm. I might pop back here now and then, a little odd moment, a little hello, this is what I've been doing. There are a couple of railway-related things I always meant to do and never did; I might do them. I had an idea of a book, but I'm finding it hard to get it down on paper; the pressure to make it good (instead of this old guff) gets to me. Maybe. I just don't know. I'm nearly 40, and this seems like a good way to bookend my thirties. Close it off. I finished my beer and headed down to platform 14. I waited. Then I took a familiar purple train home. Huge congratulations on reaching the end of your Northern railway odyssey. Particular congratulations on completing two challenges, that's visiting all the stations and writing about them - the scale of the latter task should not be underestimated. It's been a joy to discover the North alongside you, both through its stations and more especially via your journeys inbetween. Whatever you choose to do next, please keep us all fully informed... as you have done so admirably over the last decade. I have enjoyed your tour of the beautiful stations and locations, even though I can take more consolation from the places that are a bit crap and neglected, like Longport and Burscough Junction, and even though I have small sympathy for the nationalised railway. I've loved reading this blog. Fitting that it ends in such an understated way but does it really have to end? How about Merseytart does the notable train stations of Britain and Europe? Free yourself up to go to the places on the map that you are really interested in and skip the dull ones. I think you've earned it. I hope you keep writing, something, anything. Let us know, won't you? Just wanted to say how much I've enjoyed reading your blog. I discovered it last year and went on a binge going back in time and reading all the stations you'd done before then, and then have enjoyed keeping up with your travels. Your writing gives a wonderful sense of all these different Northern places -- every time I go someplace new I look it up to see what you think of the railway station and of the town. Thank you for doing it and congratulations on finishing. Scott - this blog has been fantastic. I've loved reading it since discovering in 2010 : following the new articles and pouring over the old ones in-between. Funny, insightful, honest, rude, thoughtful: it's been one of my go-to places on the internet. Great photography too! I hope you keep writing - let us know here if you do! Never mind a book though - I want an 8 season Netfilx adaptation ! I'm sure you'll still be zooming round the country by train as a pensioner. My (now 99 year old) Grandad was still doing rail trips until his late 80s - flashing his BR pensioner pass to get free travel. I presume he still has it somewhere, although these days he gets out far less. What's great about this blog is that it does what a great blog SHOULD - it tells us about something that could be deemed trivial but which becomes in the telling significant. And equally important, it has told us so much about you, and about the world you live in. Thank you, most sincerely! 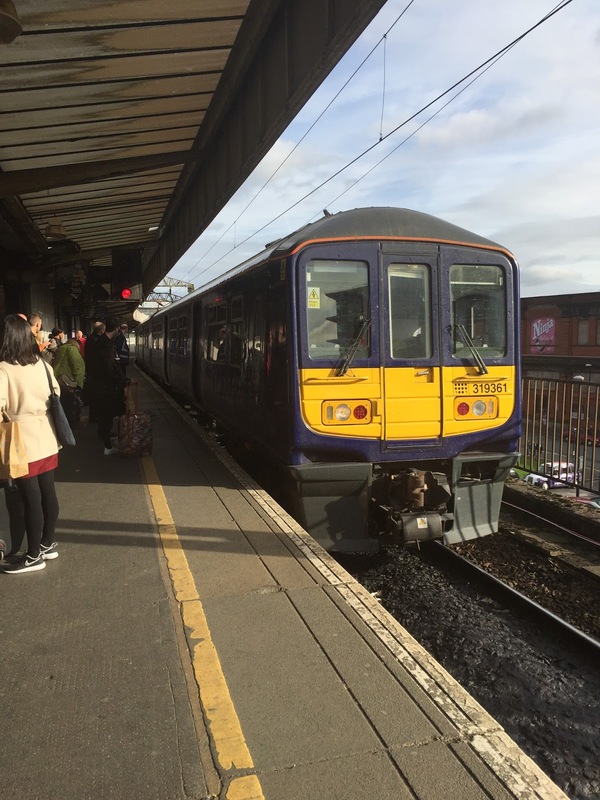 To complete the blog title with the Victoria Wood's Crewe to Crewe finesse; 'We've given up on travelling hopefully, but we do expect to arrive'. Customers please notice that the toilets on platform 3 are closed due to them not being open; passengers desperate for a wee can nip behind the left luggage lockers, which are also closed due to people using them. Please do not ask for a ticket, as a refusal often offends. We regret that no answers can be given to timetable enquires. We don't travel on your railways, please don't travel on ours. Congratulations on finally completing this epic journey! I think I've been here since pretty much the start and will really miss these excellent posts. It really has been fascinating to find out about such a surprising variety of places, many of which I know I'll never get the chance to visit. I hope you're proud of what you've achieved. Regulars will remember the posts where it all looked like it was going to end prematurely but you battled through it and kept us entertained. I agree a book would be brilliant and you never know could be potentially quite lucrative given how popular railway books seem to be. I hope you do keep this sporadically updated. Surely you won't be able to leave the new stations alone when they open?! All the best for the future. I'll still be following on Twitter. Congratulations and thank you for many great reads. Scott, I can't even remember now how I even found your blog, the old merseyrail one I mean, heaven knows what I was looking for to find 'merseytart', but I am so glad I did back then. I have had so many laughs, smiles and to be honest, almost tears reading what you have written over the years and it will be really sad if you do decide to call it a day here and not dip your toe back in now and again, I really hope that you do, and I am positive I am not alone in thinking this too. Thanks, and I seriously mean that, you blog has lightened some of my heavy days too,cheers buddy. Thanks Scott. It's been great: entertaining and personal. Good luck with your future endeavours. We are walking the canals of the north west. We are using trains and buses, so our paths have often crossed. Enjoy your spare time before you commit yourself to another activity. The Ian Allen bookshop at Birmingham New Street has closed in the last year too, as part of the massive redevelopment there. No space any more for the small, the interesting, the offbeat... It will be missed, as will your 'blog: it's been a pleasure to revisit some old friends of places and see others for the first time vicariously through your wanderings. Loved your blog. All the best in the future. Keep up writing in some form, you are good at it. What a wonderful and fitting end to the blog and your adventures and after visiting so many obscure places it's interesting to read your description of somewhere most of us know all to well! Thanks for an excellent and amusing read for the last however many years it has been. It was a privilege to appear in the blog of the Cambria Coast trip when I quite rudly interupted your lunch! There's still a ticket for a trip on the Talyllyn Railway with your name on it. Perhaps in 100 years time a brightly attired retired politician will make a TV show where he travels the North clutching a iPad with the blog loaded, staying in the same hotels and contrasting the stations of the future? Hi Scott: we've never met but I follow this blog avidly. In darker moments I look at the real time trains website to know that life continues and people are still moving around using steel wheels on steel rails. I read this as a grander version of that -- life continues, sometimes at walking pace, across the wonderful Industrial North. You know that doing your duty would never be a good way to continue, but I pray that you will write something. A similar tempo with a similar focus. It would be shame now to keep to yourself this gold that has been coursing from your fingertips! I've loved reading your blog, thank you so much for doing it. And please, KEEP WRITING! Don't stop writing. Never stop writing. I just wanted to say how much I have enjoyed reading your blog. It's both engaging and informative, and the only one I make a point of reading. It was pleasing to learn how much you liked my present home, Clitheroe, but saddening that my home town, Crewe, was not a favourite, although given your experiences there perhaps it faced an uphill struggle. I'd agree that it is a pale shadow of its former self, but to be there when I was a kid in the 50s and 60s was to live somewhere that was nationally important, at least in a railway sense. It was once a thriving, busy town. Now it may be a bit down at heel, perhaps the unkind would say a bit of a dump - but it's still my dump! All the best for the future and, as others have said, I hope you find another project so that you can entertain us once again.